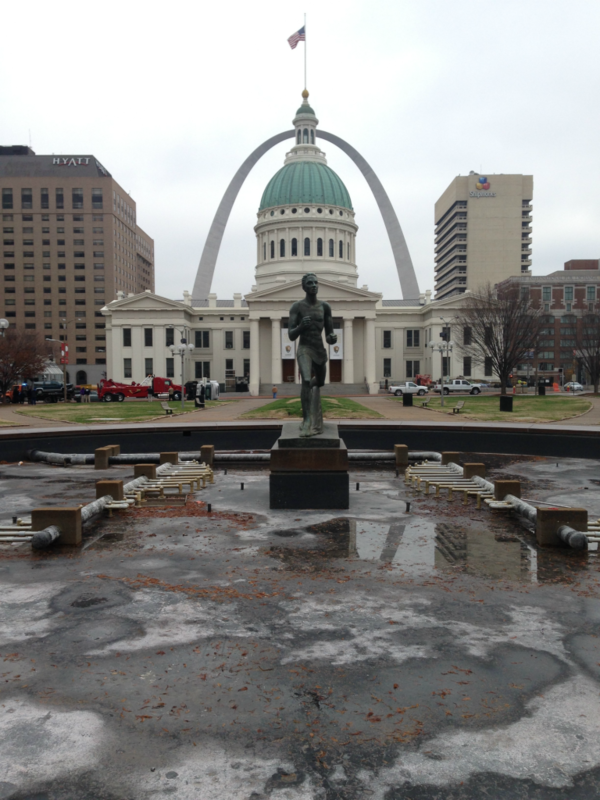 On a warm, gray November morning, St. Louis’ fleet bronze man was standing in a dry shell. At Kiener Plaza, the fountain was drained around William Zorach’s The Runner(1966). The statue famously runs westward, a siting dynamic that writer Barringer Fifield rightfully compared to the city’s own migration away from the river and the polyphony of the central city. 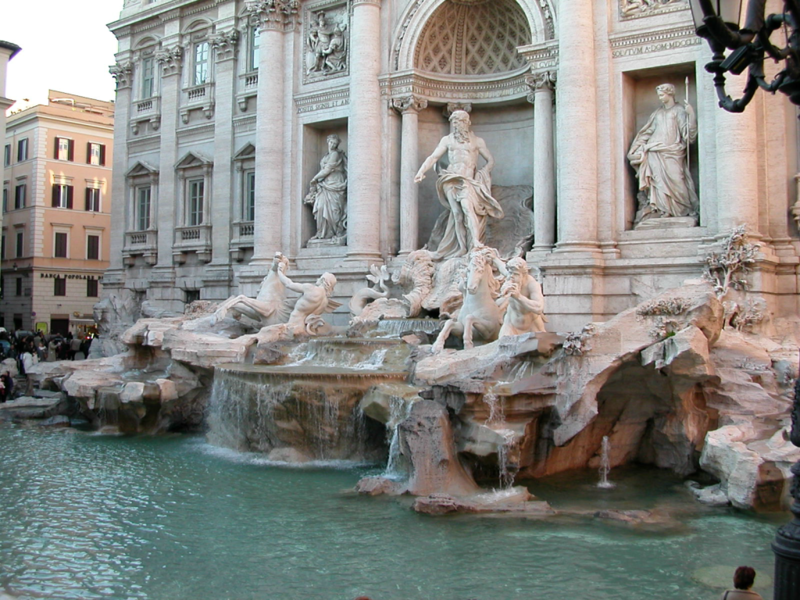 Without fountain jets providing a sense of triumph over obstacle, the figure seemed less heroic than stilled. 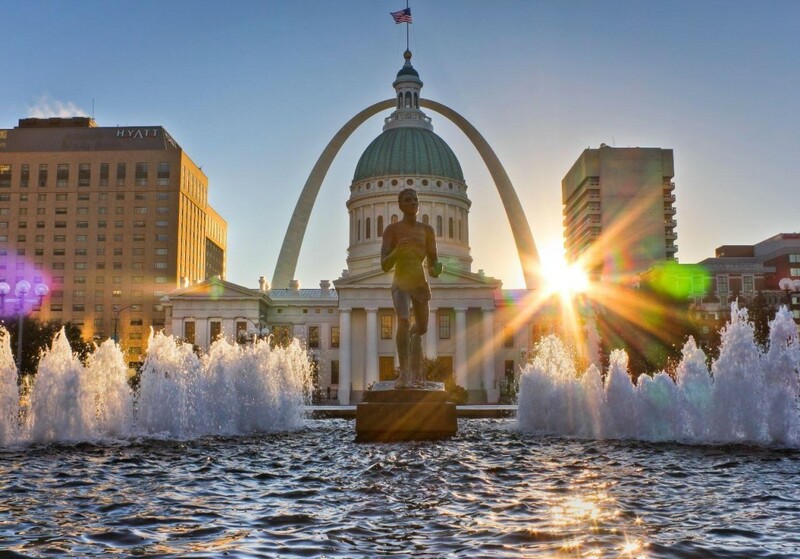 This state is fitting for a statue that will be the only relic that will survive the reconstruction of Kiener Plaza. Kiener Plaza’s cracked walkways and loose bricks resonate with the fading sidewalks and pavement of Washington Avenue across downtown, which have recently attracted public scrutiny (a regrettable step away from the 2011 “Great Street” award from the American Planning Association). While Washington Avenue’s civic landscape only needed a little more than a decade to show clear decay, Kiener Plaza’s two halves followed the path of over 50 years to reach a moment where destruction was proposed. The fates of these two public spaces illustrate the pitfalls of durational urbanism – the production of space to serve the momentary fits of downtown’s pursuit of reinvestment. From the perspective of heritage conservation (or historic preservation), the rapidity of decline and replacement of such spaces poses a major challenge. How can there be a robust cultural consideration of the significance of landscapes whose impermanence seems intentional, and which fall outside of both intellectual consideration and legal protection offered by preservation? The pattern of landscape decay and replacement also seem to be calling for a remedy that does not simply freeze one iteration as the “pure” form of a place, but instead one that disrupts the cyclical destruction of landscapes in tune with adjacent projects such as real estate investment and public works projects. Historian Pierre Nora wrote about the “acceleration of history,” which can literally displace sites of collective memory, which are forged through real human interaction, and give rise to narratives of history, which can be used by actors to organize or edit the past. Kiener Plaza and Washington Avenue are edited, contrived sites whose histories serve to provide symbolic and economic utility. They are little utopias with shelf lives, and they are set up for destruction to serve the next invented “history” of place. How many times can St. Louis rebuild its civic landscapes, and at what cumulative cost to a diminished city government and limited local economy? Walking across Kiener Plaza, one is reminded of the virtue of maintenance — and the legibility of decay. Decay writes its own future relief. American urban history is the history of the anxieties of remaking places. Even historic preservation in America accepts the fable that J.B. Jackson calls “the necessity for ruins.” We can’t make any place without breaking it in some way, and reshaping its visual weight or meaning. The impetus to remake seems artistic, but ultimately is an expression of political economy. Kiener Plaza itself is an agglomeration of place-making gestures that were spearheaded by downtown real estate and business leaders seeking a way to generate surplus value for adjacent property. The first instance of the plaza came in the 1960 document A Plan for Downtown St. Louis, and its utility was spelled out: the park blocks would be part of a park mall that would spur investment in new office buildings surrounding it. That vision, later called the “Gateway Mall,” largely came to pass. Today the drive for reinvestment is compelling the execution of the older landscape, and Kiener Plaza will be destroyed and remade soon. 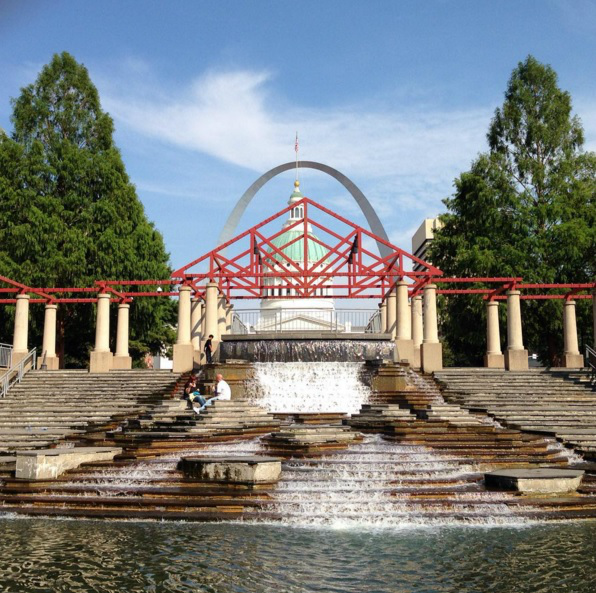 Kiener Plaza was fashioned in two incongruent phases: the tepid formalism of its eastern half where Zorach’s athlete holds court, completed in 1962, and a more imaginative and inviting western amphitheater completed in 1987. The two sections are joined by a closed section of Sixth Street. 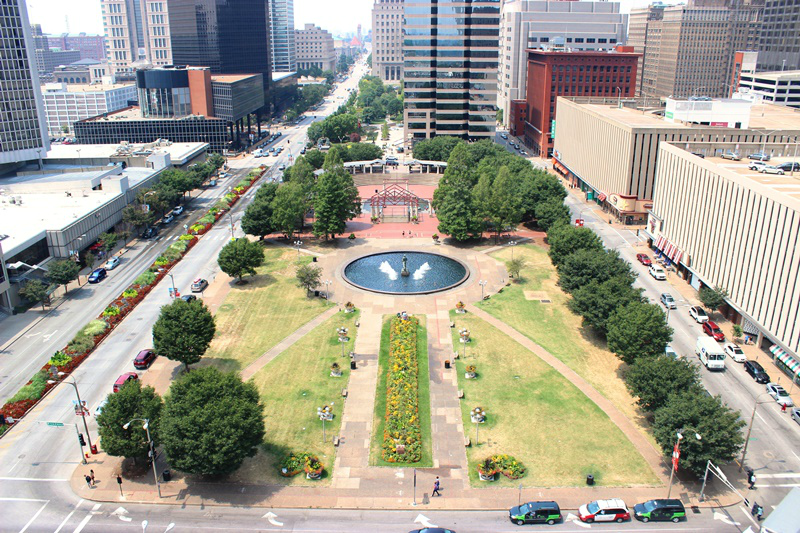 Kiener Plaza is a showcase of the changed iterative priorities of landscape architecture in a twenty year period. A revised classicism of the 1960s bows tenuously toward the postmodern sunken garden of the west. One vision, born in the era of perceived urban turmoil and mass reconstruction, presents an orderly and controllable space. The later addition offers a symbolic staging ground for civic pageantry that has indeed attracted uses ranging from Cardinals rallies to Occupy. To the general public, the western half — officially named for civic giant Morton D. May – constitutes “Kiener Plaza.” The pomo recreation of Trevi, framed by the pergola of cast stone Doric columns and flimsy-looking fire engine red steel Howe truss pediments, is a public icon. Designed by Team Four Architects at the height of 1980s aesthetic over-reach, there is a campiness to the endeavor. The Roman fountain stands inside of a ghosted Green temple, while the hardscape is shameless in its red brick proto-St. Louis conceit. 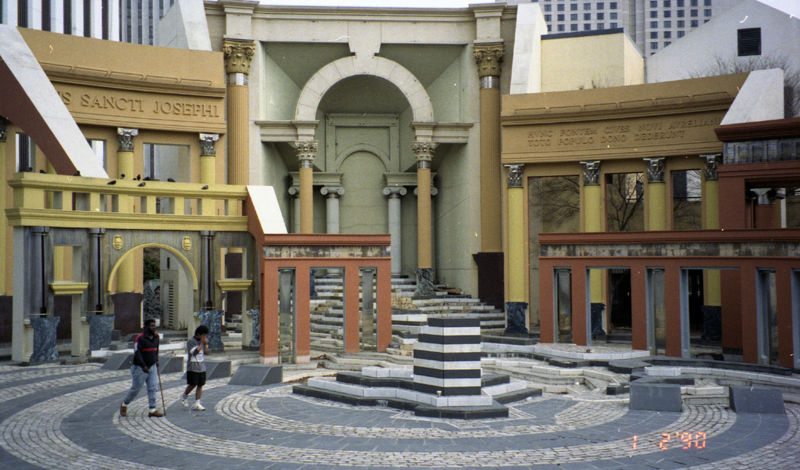 Yet there is also a dramatic sense of history, with the nods toward antiquity, the open agora of the European plaza, Charles Moore’s Piazza d’Italia in New Orleans and – most clearly – the form of the Old Courthouse to the east (Greek). The visual relationship between the Morton D. May Amphitheatre and the Old Courthouse is one of the few satisfying relational moments in all of the Gateway Mall. 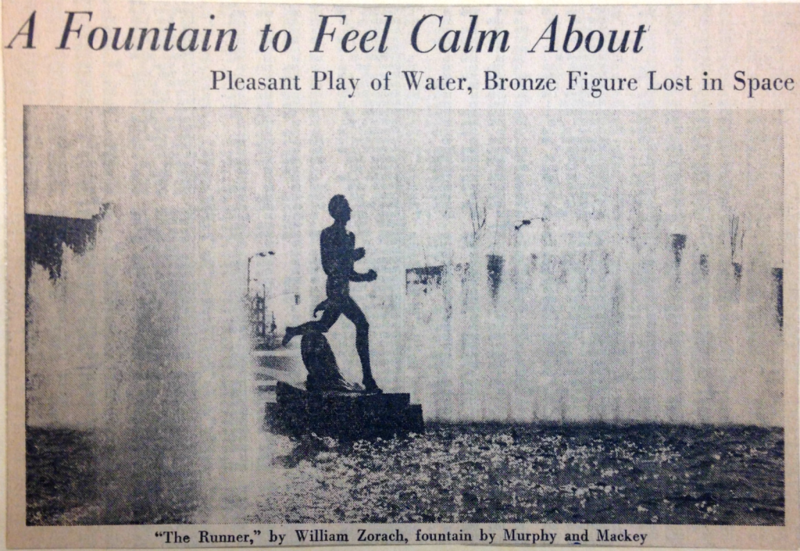 Few today recall the origin of Zorach’s runner, which arose from steel company executive and former Olympic track competitor (1908) Harry J. Kiener’s gift of $200,000 to the City of St. Louis to fund the work of an architect and sculptor to design a statue with athletic theme set in a fountain. Kiener preferred Forest Park, but the Busch Memorial Stadium project led civic leaders to forecast siting near the new athletic facility as more appropriate. Kiener’s gift propelled an all-star mid-century jury committee chaired by St. Louis Art Museum Director Charles Nagel, and including St. Louis Post-Dispatch Editor Joseph Pulitzer, Jr.; Mrs. Eero Saarinen; architect Edward Durrell Stone; and Dean of the School of Fine Arts at Washington University Kenneth Hudson. While Kiener stipulated that the sculpture need at least one athletic figure and be inscribed with his name and birthdate, he left the details open. Kiener entrusted execution to David R. Calhoun, Jr., president of the St. Louis Union Trust Company. Calhoun deliberately selected Mrs. Saarinen and Stone based on the Gateway Arch and Busch Memorial Stadium projects, and thus suggested that the project should coordinate with the new modernist architecture remaking the look of downtown. Alexander Calder nearly won the competition process, in fact, but his abstract mobile offended a literal-minded Calhoun, who reminded the jury that there must be a human figure. Thus Calder was nudged out by Zorach’s inspired runner. Zorach had already seen installation of his work at Radio City Music Hall and in the Benjamin Franklin Post Office in the District of Columbia, among other places. His heroic sprinting male figure seemed to echo the abstracted realism of Carl Milles’ figural group The Meeting of the Waters just eleven blocks west at Aloe Plaza — except for its obvious inferiority. The construction of the fountain started in May 1965, and the sculpture was placed in October 1966 to tepid welcome. Perhaps Zorach’s lack of familiarity with cast sculpture spurred a work strangely lackluster, set in a modest circular fountain of somewhat superior grace, designed by Murphy & Mackey (same architects as the domed Climatron). Something about Zorach’s runner, beyond his westward pulse, bothered St. Louis. Architecture critic George McCue wrote in 1966 that the sculpture was “quite unequal to the occasion that is proposed by the site” and enumerated the site’s relationships to the Old Courthouse, Wainwright Building, Gateway Arch and Busch Memorial Stadium as reasons compelling a great work. Civic leader Howard Baer described Zorach’s statue as “less than second rate” in his autobiography, and many critics since — including St. Louis Post-Dispatch critic E.F. Porter, Jr. — have concurred. 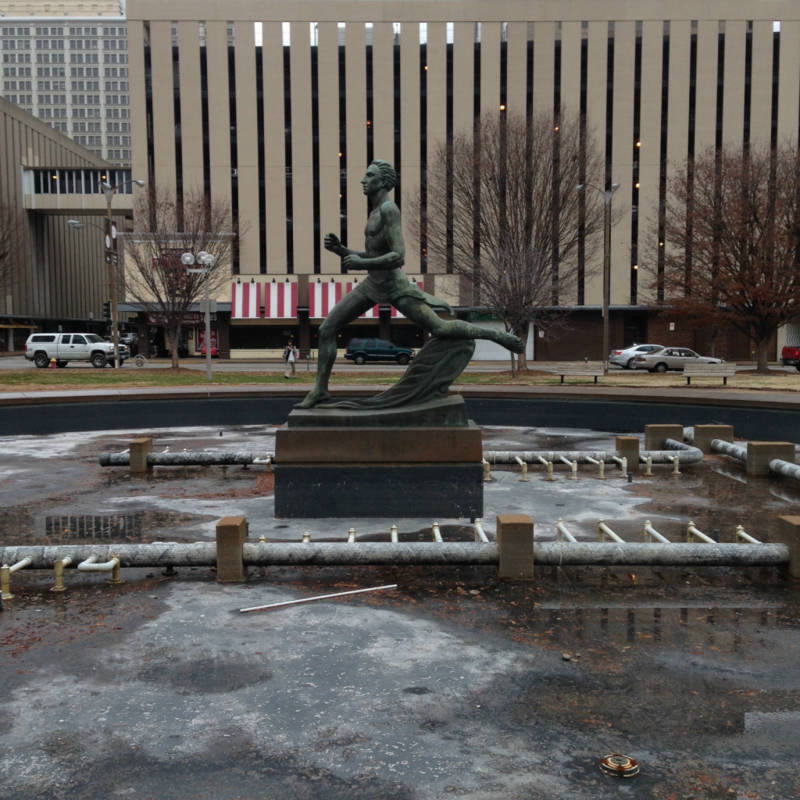 Why is it, then, that The Runner will be the sole remnant of Kiener Plaza to remain intact after the forthcoming revamp? 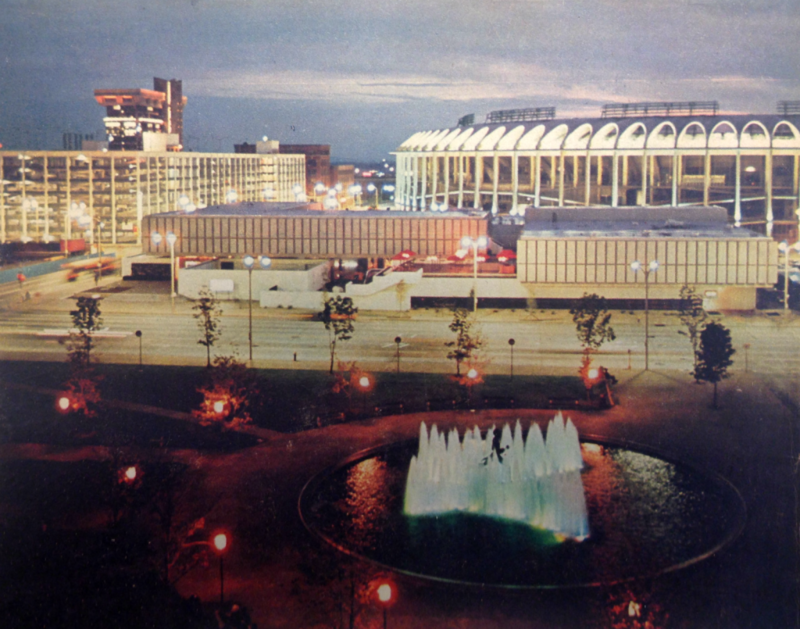 In 1976, city Parks Department Director Georgia Buckowitz lauded Kiener Plaza as “the No. 1 spot for downtown activity now.” Kiener Plaza hosted hundreds of permitted events that year, and even an outdoor café operated by John Abramson called “Café Marguerite.” Still the plaza’s heyday was short. 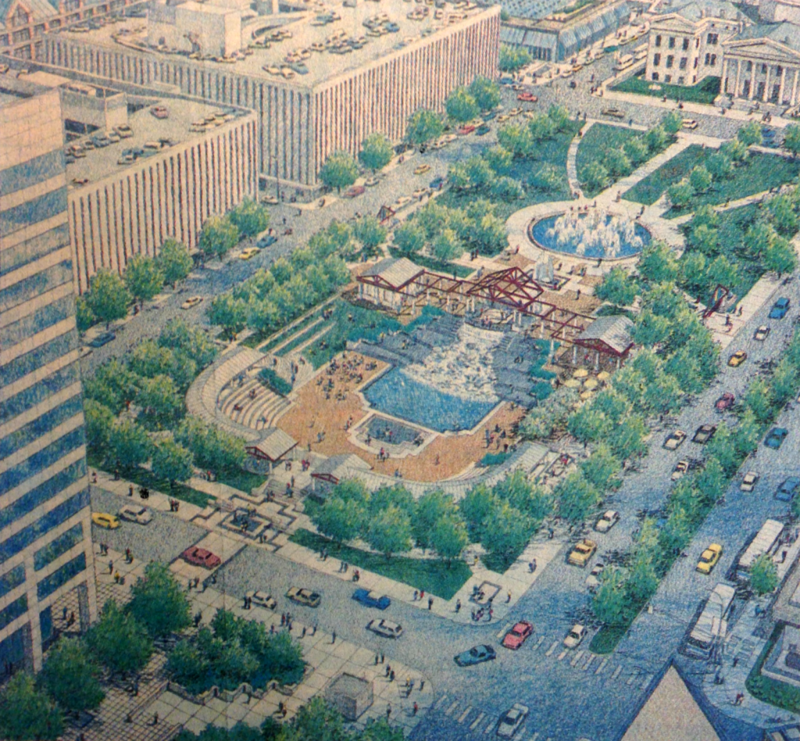 By 1982, with an official plan for the Gateway Mall blocks between 7th and 10th streets adopted, and the block to the west eyed for addition to the official Kiener Plaza, the original design met scorn. 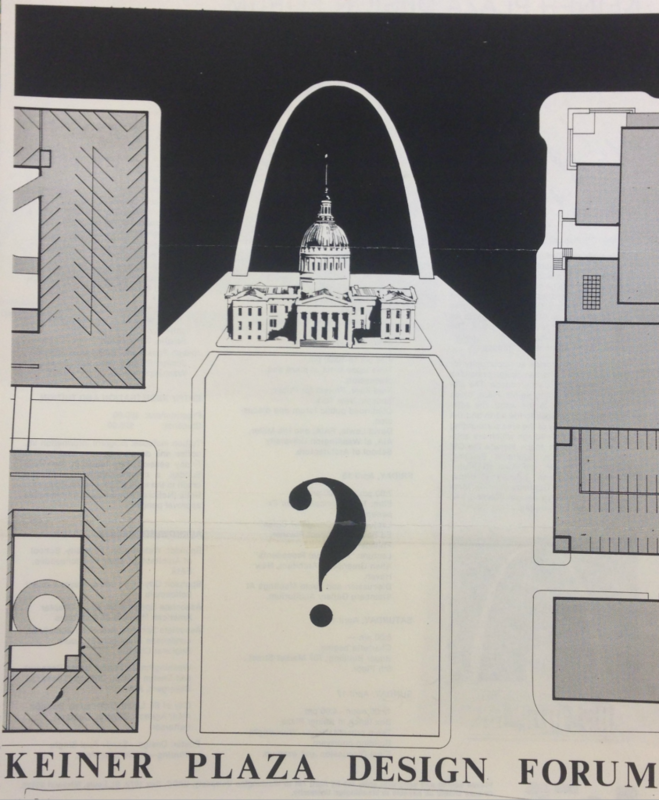 In April 1983, the City of St. Louis, the American Institute of Architects St. Louis Chapter and the Washington University School of Architecture hosted a design forum on Kiener Plaza. Eight teams of architects presented designs, and public input was recorded (including a suggestion to remove Zorach’s statue altogether). The question of preservation of buildings to the west in the path of the Gateway Mall was met with a comment that “old buildings are nice, but St. Louis needs to be redone.” Within thirty years, Kiener Plaza itself would be felled by such logic. The forum took place at the Buder Building, demolished the following year for the Gateway Mall, and included a talks by renowned urban planner Ed Bacon and Project for Public Spaces leader Fred Kent. According to an April 18, 1983 article by Post-Dispatch arts editor Robert Duffy, all eight teams called for removing Zorach’s statue and the fountain pool by Murphy & Mackey. One plan, designed by Kyu Song Woo of Woo & Williams Architects, introduced the sunken plaza idea along with a never-pursued plan for subterranean connections between Kiener Plaza and new downtown office buildings. Charles Blessing, an architecture professor from Detroit, called for enclosing Sixth Street as a glass shopping arcade. 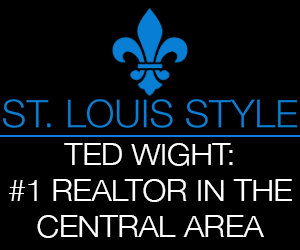 Most bombastic was the claim by Terry Wendt, director of the Crosstown Development Corporation in Kansas City and participant. Wendt claimed that his team’s plaza design constituted, in Duffy’s words, “a plaza so magnetic that it would persuade young professionals to flee the suburbs and to move downtown.” This refrain was an explicit utterance of a refrain downtown boosters still sing. 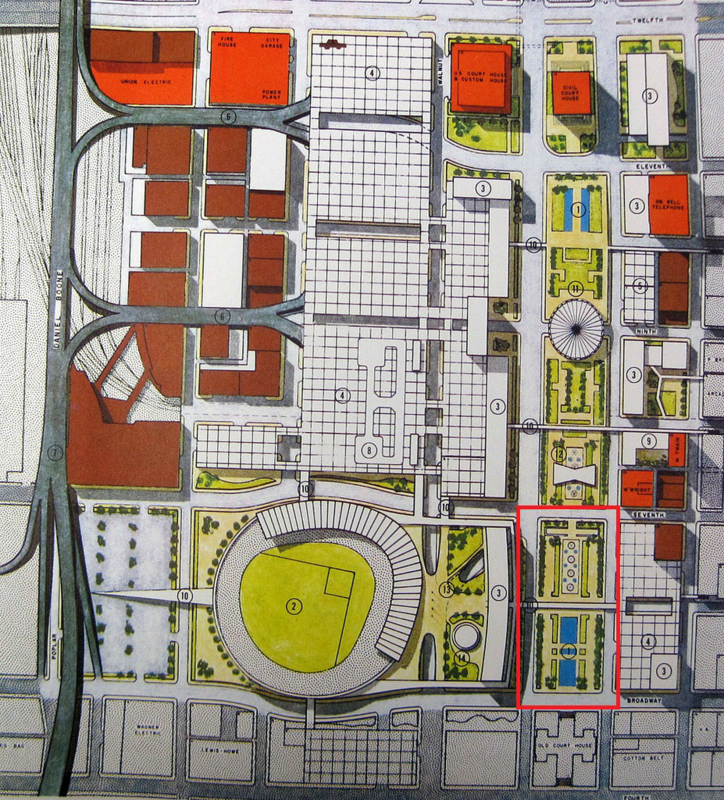 Wendt’s proposal included an open-air theater, running track and fountain. These “active” landscape features are today commonplace in urban landscape design. 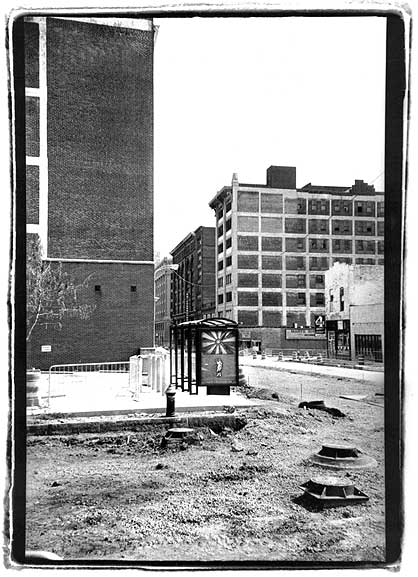 At the time, the results of the forum – including Washington University School of Architecture Dean Joseph Passoneau’s rejection of the need to demolish any more buildings downtown to create open space – challenged both the downtown booster view of public space and earlier landscape architecture precedents. Acquisition of the block west of the original section of Kiener Plaza started in 1984, but languished when Charles Cella’s Southern Real Estate and Financial Company sued the city to prevent condemnation of a parking garage that it owned on the block. Eventually the suit was settled, and the city assembled the land through purchase of 25 percent of the block and lease with Cella’s company for the rest. The American Café and Bar at 524 Chestnut Street, owned by Rick Yackey (still active in city development), was demolished. In June 1986, the Land Clearance for Redevelopment Authority unveiled the $3 million plan for the new block. Sixth Street would be closed and the western block would give rise — or fall — to the sunken amphitheater plan. Architect William Albinson was principal project designer for Team Four Design, stated the project’s design principles: maintain symmetry to emphasize an east-west axis to sync with the Gateway Mall project; activate the site with features like the fountain and 500-seat amphitheater that would draw people; echo the architecture of the old Courthouse; create an “outdoor room.” Subtract the symmetry, and the goals seem generic today. This raises the question of whether the function of Kiener Plaza truly is obsolete, or simply its symbolic value. Albinson’s design, which was completed in October 1987, caught the scorn of Post-Dispatch critic E.F. Porter, Jr., who mocked its jocular classicism as “Tinkertoy Palladian.” The brick plaza and cascade across quadrilateral concrete elements and granite would become popular elements, but the defining pergola-style surround never found its constituency. Albinson publicly posed the assembly of cast-concrete Doric columns, standing-seam roofs, templar forms and steel tracery pediments and beams as playful. Porter countered that the design seemed flimsy, especially because of the red steel component. Hadrian’s Villa at Tivoli was an obvious reference point, but one that set up a dismissal. Another source, albeit apostasy in architectural history, could have been the minimalist modernism of Mies van der Rohe, which embraced the ahistoric use of the color-neutral steel beam. The historicized steel beam in St. Louis Cardinals red offered quite a fun modernist pastiche. Almost thirty years later, the same malaise is receiving a new cloak. Today’s civic push to generate value in downtown real estate demands a new face and the amphitheater will be demolished soon. 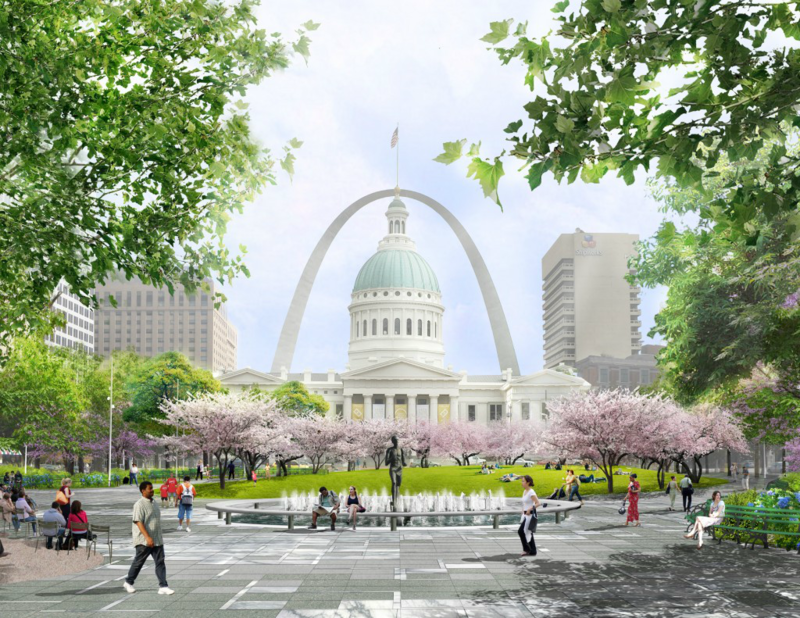 CityArchRiver included a revamp of Kiener Plaza in its plans for remaking the Jefferson National Expansion Memorial, a project that nearly faithfully recreates the entire downtown placemaking program of the 1960s across conterminous geography. The utopia of the 1960 downtown plan, surmounted by the utopia of the 1980s city enshrined in the amphiteatre, will be subsumed again by today’s utopian architectural script. Each revision has required destruction – first of the historic city fabric, then of the earlier era of urban renewal, and now of the last revision to the postwar urban renewal’s visual manifestations. The domino game seems unlikely to guarantee that the new Kiener Plaza, designed by Michael Van Valkenburgh, will last a generation without some major alteration. There is the anxiety of decay. 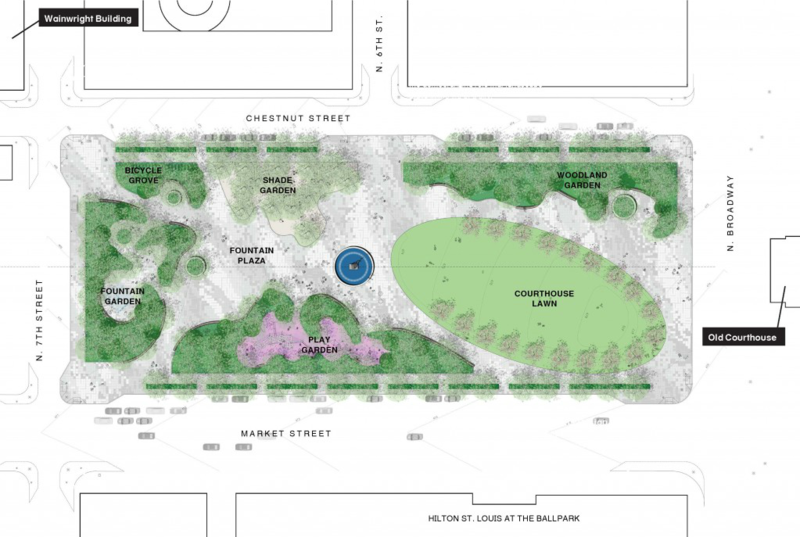 Van Valkenburgh’s $20 million plan for Kiener Plaza addresses the visual disconnect across the park block, while applying some generally good ideas about arrangement of space. Taxpayers foot the bill this time again, with funding coming from a sales tax increase passed in 2012 for Great Rivers Greenway and CityArch River. The plan reduces assembly space slightly, from 22,500 square feet down to 20,000, and brings the space to the center. The size of the park will expand, due to narrowing of Market Street. Of the current features, only the Runner will remain. Architect Nate Trevethan in Van Vankenburgh’s office told St. Louis Public Radio in 2014 that public comments were strongly tilted toward keeping the statue on axis with the Old Courthouse. Public comment questioning the need for surgery, or valuing the amphitheater’s now-historic role in civic assembly, was summarily discarded by CityArchRiver and Van Valkenburgh. 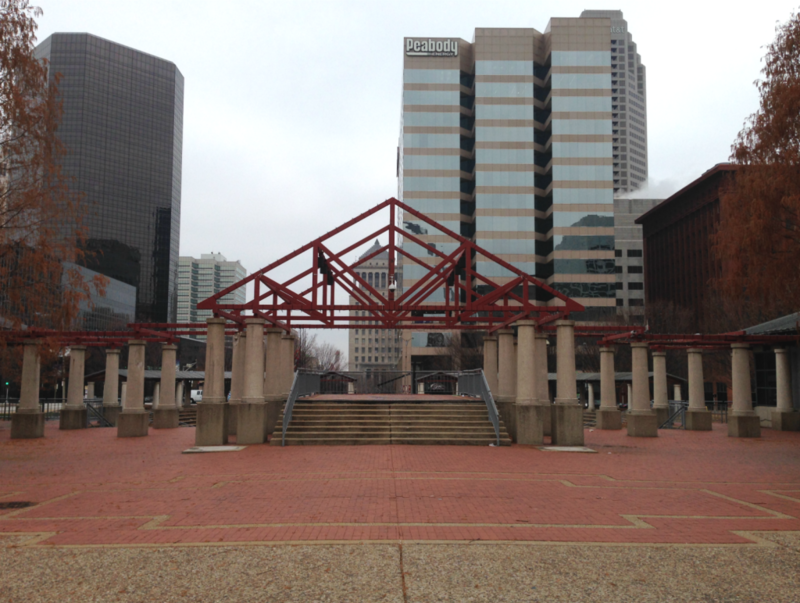 The new Kiener Plaza throws shade on past ideas, without acknowledgment. Critic Porter opined back in 1987 that Kiener Plaza should have simply been articulated as “a grove of trees.” That idea itself is a continuation of Richard Serra’s poorly-implemented, beautifully-dreamed plan to surround his sculpture Twain with a grove of oak trees. Other sources are less concealed. 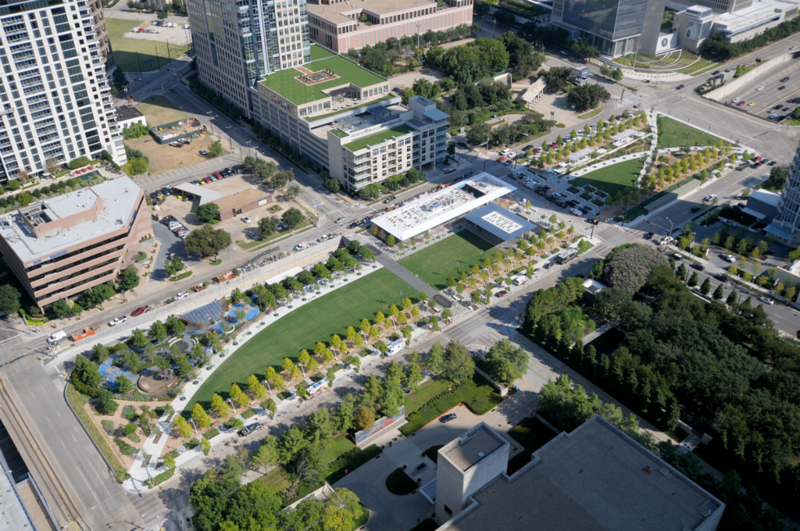 There are shades of the use of a “hallway” and algorithmic asymmetry found in The Office of James Burnett’s Klyde Warren Park in Dallas and even the reliance on planting-border curvature found in Van Valkenburgh’s own Brooklyn Bridge Park. 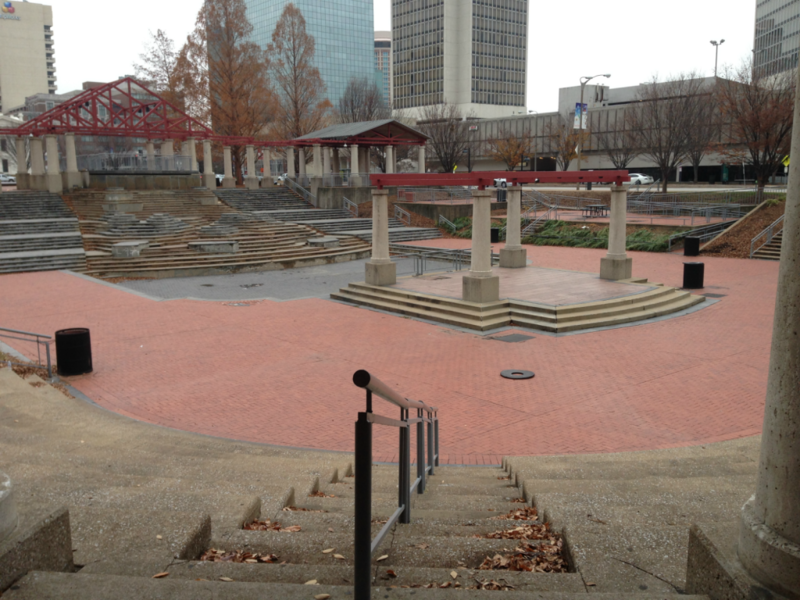 Even the city’s preservation apparatus failed to give Kiener Plaza consideration as a designed cultural resource. In October, the Preservation Board unanimously voted to approve the proposed redesign from architect Michael Van Valkenburgh. The city’s Cultural Resources Office made a recommendation to the Board that refrained from any identification of either the 1962 or 1985 section of Kiener Plaza as a cultural resource, and also from any evaluation of whether either designed component rated as “merit” or “high merit” under the city’s preservation ordinance. Landscapes remain ambiguously protected under the city’s preservation ordinance, and the architectural achievements of postmodernism continue to evade historic preservation consideration ahead of their annihilation. In the case of Kiener Plaza, the design principles that would impair constant reinvention seem elusive, but they might become more apparent through an explicit examination of the cultural heritage components of the landscape. The use of the amphitheater for all manner of public events ought to bestow some consideration of the designed elements as “cultural resources,” especially since at least a few members of the public have expressly made such claims. Beyond that, the coordination between the original fountain and statue design and the modernist remaking of downtown seems very significant. In light of the city’s own survey of non-residential mid-century modern architecture, and the current St. Louis Art Museum exhibition St. Louis Modern, the confusing Murphy & Mackey/Zorach design moment via a jury that combined Pulitzer, Stone and Saarinen seems worth some pause on the part of authority. The preservation of historically flawed space is not necessary, but compels a strong evaluation of design merit and public reception. Kiener’s own legacy clearly is profoundly intriguing. Yet no civic remorse has been offered for the gesture of erasure of any of these aspects of cultural heritage – even the designed cultural heritage more easily identified as protected by the city’s preservation ordinance. The durational instability of Kiener Plaza’s landscape makes it clear that the process for making and remaking public space in St. Louis is not effectively constrained by considerations of cultural heritage, architectural merit, cultural appreciation for the recent past, preservationist willingness to conserve postmodern architecture and landscape architecture, material durability, public input and fiscal restraint. Fundamentally, clarification of the preservation ordinance’s protection of recent past and landscape designs is needed. A larger step would be the adoption of a public commission – not a nonprofit advisory board, but an actual public body – to govern the revision of public parks. In the end, however, the Kiener Plaza story – like that of the Washington Avenue streetscape – is one in which durability, cost and longevity of civic space design have been clearly subordinated behind the civic imperatives for economic growth and symbolic spaces. If St. Louis is to replace Kiener Plaza or any other space with a design that will last longer than thirty years, it will need to reconsider the ways in which the city initially creates public spaces – and the casual (and expensive) ways it discards its own celebrated spaces when the party is over. The cycle of utopia and oblivion could even come to a rest at some point.